A Welsh Assembly Member has voiced fears over potential redundancies following Newsquest’s takeover of NWN media. The regional publisher announced on Tuesday it had purchased the independent group, which publishes a series of titles across North and Mid Wales, Cheshire and Shropshire. NWN currently employs around 300 people and publishes around a dozen weeklies and one daily, The Leader, which circulates in Wrexham and Flintshire. 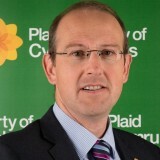 Llyr Gruffydd, a Plaid Cymru representative for North Wales in the Welsh Assembly, has expressed concern over the move – citing previous job losses at Newsquest’s Newport production hub as an example of “problems elsewhere in Wales”. In a statement on his Facebook page, Mr Gruffydd, pictured, wrote: “The Welsh media is already fragile and North Wales Newspapers was a rare example of a family-run firm with strong local roots in North-East Wales and across the border to Oswestry. “I hope the takeover will not mean any redundancies among the 300 employees, although that seems inevitable given the nature of these acquisitions by the US-owned corporation. “It’s also important that the 13 titles continue to be published and printed here in Wales – NWN invested in new printing presses on Deeside and workers will want reassurances about their jobs. HTFP has approached Newsquest for a response to Mr Gryffydd’s comments. He’s a bit previous, isn’t he? Still, better to suffer a few redundancies than ‘do an Oldham’.